I first thought of buying a dishwasher nearly a year ago. I was inspired when I saw my friend who stays in my building, using one. I remember the day, last year, when I went to her place to understand the value it could bring to life. I was confused about what I wanted. For those of you who might not know this, in India, it’s still very common to have a lady who comes in to wash the dishes. Dishwashers are not usually used. However, the culture is slowly shifting as maids are becoming hard to find. I have been using my Siemens dishwasher for a few weeks now and I feel that whatever I heard from my friends before purchasing it, is all correct. A big thanks to Venkatraj and Rajani, my neighbors who have patiently answered all my queries. They have been using a dishwasher for nearly 4 years now. This post includes information on usage of detergents, which I gained mostly from them. To make the decision a bit easier for those who might be considering buying a dishwasher, I have elaborated on the pros and cons of using one. You need to get the guy in your house who perfectly packs your suitcase when you take a vacation. He will be the best person to load your dishwasher. Aligning vessels could initially pose a challenge. However, with practice you will start using those vessels which fit well in your machine and will slowly avoid using those which don’t. You will need about 10 minutes to load the dishwasher. This, initially could leave you tired if you were accustomed to piling dishes for the maid to sort out. Unloading a dishwasher will leave you pleased. Simply because when your maid cleans vessels she probably leaves them hap hazard. There are cups over plates, over that big milk vessels and sometimes even spoons. That way when you need something you need to dig into a pile of vessels, clang them around and come out frustrated if you cant locate a small object like a fruit fork or a cooker whistle. However when you unload vessels from a dishwasher you will find them in order. They get washed in the same place where you kept them so you dont need to hunt for anything. Its the same difference as placing clothes in a cupboard or in a pile on the laundry table. One place its organized and the other place it isn’t. So although you had to spend that extra 10 minutes while loading you save that same time while unloading. You will need to first check if an area in your kitchen meets the plumbing requirements. The electrical point should most probably not be a problem as you can always use an extension box. As for the water outlet pipe, you can use the same outlet currently being used for your wash basin pipe or your washing machine. Yeah, you might need to check if you have the space in your kitchen to fit a dishwasher and if there is a water inlet valve that you can use. If you are using a detergent like finish powder or some other local brand, you will need to rinse all vessels before loading. This is an activity that could possibly burden you. However, if you start using the finish power ball detergent you wont need to rinse anything. You will just need to take the one-time effort of indenting it and then on for the entire year you can load your dishwasher with perfectly dirty vessels. That includes milk vessels, greasy kadais, idli stands, etc. No rinsing, no pre-cleaning required. In fact, the manual that comes with finish powerball says in its instruction set that you dont need to rinse dishes before loading. If you are not happy with finish powerball then try the quantum power ball which is expensive but more effective as well. If that also doesnt work, dude! What are you cooking, anyway? 1. Detergent box : Here you put the detergent powder / tablet. In case you are running just half a load, approx 15 gms of detergent will be enough. For a full load you will need about 25 gms. The measurement marks will be present inside the detergent box so you know how many gms you have filled in. If you are using the quantum powerball tablet you just need to place it in the detergent box. The outer fine plastic cover of the tablet gets dissolved in hot water. The remains can be found in the garbage sieve. The regular powerball tablet has no such outer cover. The shiny foil in which it comes needs to be discarded before use. 2. Rinse-aid : You will need to fill in a rinse-aid liquid in the designated container which will be consumed slowly over a month or two. 3. Salt : The dishwasher salt is different from the regular salt we use. You will need to fill about 1 – 1.5 kgs in the salt unit. For the very first run of the dishwasher, you will additionally need to fill the unit with water. From second time onwards, just salt is good. These instructions were provided with the Siemen’s dishwasher. Please check specifics with your dealer, based on your brand. The rinse-aid liquid and salt can be loaded and used over a period of time. When exhausted, an indicator will glow on the display board. The detergent however, has to be loaded for every run of the dishwasher. If you cook yourself or cook only once a day and re-use the food at night then a single run of the dishwasher will suffice. However, if you have a cook who generously uses vessels or yourself cook a variety of food twice a day, you could find the need to run the dishwasher twice. The time spent in washing could bother you. Workaround : You can wash the greasy utensils like milk vessels, kadais, etc; in the automatic dishwashing mode. On the other hand, wash glasses, teacups, plates, spoons and other non-greasy utensils in the quick wash mode. That way you save on time. Dishwashers are primarily designed for a western lifestyle. Abroad, they don’t use as many pressure cookers as us. They don’t boil milk twice a day either. Hence, big vessels are more in our case and the dishwasher design might not be perfect to fit them all. Workaround : Select a dishwasher model that has collapsible blades. These blades are the ones that are used to hold plates. When you run short of space you can put the blades down and place big vessels over it (my plate blades are always down). Next, you can place some vessels over the non-collapsible blades as well. As a last resort, you might have to wash one or two big vessels yourself. Choose the ones that are non-greasy and easy to wash.
You will find yourself washing a few dishes despite having a dishwasher. If, like me, your hands can’t tolerate caustic soda in soaps you might end up with dry, rough hands. Workaround : You can try using a mild, homemade soap. Rajani suggests boiling soap nut or reetha in water for about 20 minutes to create a liquid soap solution. This can be stored upto a week and used for dishes that you need to wash on your own. It wont create any unwanted effect on your hands. Another way to solve this problem is to use a dish wand. 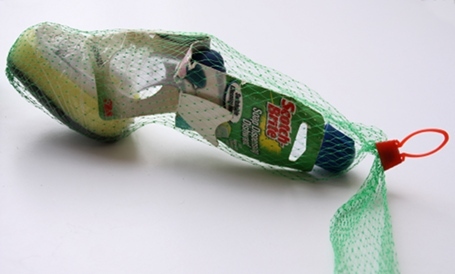 It has a tube-like body which can store liquid soap and a head made of scrub pad. A bubble-like button is also present which you can press in order to dispense the required amount of soap. Using this dishwand can prevent direct skin contact with soap. Certain vessels need to be avoided in a dishwasher. For instance wooden spoons/ rolling pins, low-grade plastic, aluminum cookers/ woks, copper-bottom vessels should be left out. Workaround : Replace your aluminum pressure cookers with stainless steel ones. Avoid using low-grade plastic boxes (its not good for health anyway). Use tupperware or any other dishwasher-safe plastic boxes instead, so they will not melt when washed with hot water. Copper-bottom vessels tend to lose their copper shine present below. I am ok with it so I continue to wash them as they are. Low-grade aluminum kadais (woks) and certain other non-stick pans could also lose their shine or get stained. You will need to replace them with quality cookware which says that its dishwasher friendly. Always look for the mark below the dish before buying. A single run of the automatic mode (meant for greasy dishes washed at around 60 deg C) will take about 2 h 15 m. In this time it uses up 3-4 Kwh of power in the energy-saving models of dishwashers. Workaround : You have the option of running a quick wash which washes in 1h 15m. Dishes come out fairly clean even in this mode. I was quite satisfied with the result. May be going forward, I will start using the speed wash as a regular wash cycle. This mode will take up as little as 1.5 Kwh of power, so you can even run the machine twice, if you like. Some models have the option of half-load where only one tray of utensils are washed. This option is also great if your second load is less. In case you face a power cut during the running of the dishwasher, it will resume from where it left off, once power returns. It doesn’t have emotions. When presented with the challenge of washing a double load, it will not reply impudently or pull a long face. When you return from a trip you will find it where you left it. It will not join your neighbor’s house for a few dollars more. It will work in the exact same way, whether you monitor it or not. You will not catch it cutting corners. It doesn’t negotiate with you from time-to-time. There is no running rate based on which its performance depends. You will need to wash dishes yourself when your machine goes for servicing once in a way. You will not face system failure every other day. without whom I could do very well. very very informative and tempting roma…u have answered all my queries…needed to know the cost…will talk to u abt it…loved all the reasons why u like the dishwasher:).. Thanks Roma for all the information.I was contemplating to buy one,your article is very helpful. Glad it was of use to you, Kavitha. Happy Dishwashing! Hi Roma. I have been struggling to find a practical blog/ information center/ forum which deals with issues that are typically ‘Indian’. Be it cooking or home appliances. It was therefore a relief to see your blog pop up on the first page of the Google search for the very specific keywords I used. 1. Which is the best dishwasher available today in India (your opinion). 2. We are getting a new apartment and would like to make dishwasher a part of our modular kitchen. Is it feasible? 3. Why can’t we use aluminium pressure cookers in the washer? 4. Can the washer handle fragile glass utensils (wine glasses etc.)? I think Siemens is one of the best dishwashers available in India today. It’s a bit dicey to accomodate a dishwasher inside your modular kitchen given the size of kitchens usually provided these days. However, if your kitchen is large enough and you have points to plumb the inlet / outlet pipes you can go ahead. If your kitchen has a well-sized balcony attached to it then that would be the ideal place, actually. Aluminium gets corroded and discolored under the influence of strong detergents and hot air drying. Finally, the cookware turns dark and continued use of it could be harmful to health. Yes, in fact it’s perfect for that. The red ball you see in the centre of the power ball tablet actually helps in cleaning fragile glasses and fine crockery. You can use a mode in the dishwasher called ‘party mode’ specifically for cleaning such dishes. Even in the regular cleaning mode I have not encountered any problem so far. Hope this helps. Happy Dishwashing. Your maid is a lucky one. thanks. very detailed view and certainly helped me. Thanks for such an informative post. It helped me too a lot. I wonder if you can help me in buying a built in microwave convection oven also. Which would be the best company to buy microwave convection in India. My LG microwave has served me well for 7 years now. Try not to use the convection mode in microwaves. For best results get a traditional oven for baking. Great blog, really appreciate it. Can it run on 5 amps? If no, how difficult it is to change 5 amps to 15 amps? Please advice. Thanks Manisha. I dont think it can run on 5 amps. It’s also not advisable to change 5 A to 15 A. I suggest getting a new socket created of 15A, thats the safest way to do it. You need a water inlet valve. Nothing specific, a regular one. Yes, you will need specific plumbing work to be done. You can ask the company person to do it (one who comes to set-up the dishwasher) or you can ask your local plumber. You will need to ensure the person is qualified in making the connection. Otherwise, it might start dripping as it gets older. 1. What is the approximate consumption of water per wash cycle? 2. Will there be any effect on the machine, if the salt content in the piped water is more than average? 3. Can we wash enamel-ware vessels in the dishwasher? In the low-water-consumption model a Siemen’s dishwasher uses about 10l of water for a regular wash cycle. This is so much lesser than what would be used if dishes were washed by hand. You can use a rinse-aid. It particularly helps in drying dishes without spots when using hard water. Also, sometimes you might see a white residue on some dishes which can just be washed away with a regular dishwashing soap. Chances of dishwasher pipes getting clogged is less yet you will need to consult the person from the company who comes to install the machine. He will check the degree of hardness in water and advice you accordingly. Yes, you can wash enamel-ware vessels in a dishwasher. Another Q; how about the task of cleaning the dishwasher itself? How often does it need to be cleaned manually? No, not really. There is no manual cleaning required. Just checking the pipes and drains periodically is a good habit. Pipes need to be inspected for clogging and leakage. Occasionally you might have some really big pieces of vegetables (& other food stuff) that remain in the drain. You will need to pick those things out and discard them. No other effort in keeping it clean. You really helped me decide in the favor of the dishwasher. Thanks. Your article on dishwasher is very informative. I am planning to buy a dishwasher and have been quite confused about which one to buy. There aren’t too many options available in India. After reading your article I am quite certain that I want a Siemens Dishwasher. Thanks a ton for this valuable info! Thanks a lot for the wonderful explanation. I have made up my mind to go for a Dishwasher asap. I just wanted to ask you one thing…? After using Siemens for quite some time, how will you rate its performance? Are you happy with Siemens? The service part? Can u suggest me some other brands also? If you feel that Siemens is far better than other brands, please let me know why. Thanks in advance. Yes, I do think Siemens is really good. Its been more than a year now and I am happy with its performance. I have a close friend who has been using Siemens for 6 years now. I think you can check out Bosch too. Its slightly expensive but reviews are good. Where can I buy powerball tablets? You can search for “finish powerball tabs” on ebay. If you keep a look out you will find a good deal on certain days. That’s when you need to stock the tabs. The information you provided is very useful. Do you have any idea about the service part from Siemens? How is your friend’s experience (in the past 6 years) on the service provided by Siemens? Did you go for any AMC? Your opinion would be helpful. The servicing is good. The Siemen’s maintenance team is much better than most others I hear about. We have not taken any AMC or Annual Maintenance Contract from them yet. Yes, my friend who has been using it for 6 years is happy with their servicing too. Thanks a great deal for your article! I wanted to know where I could get the power balls from, since they aren’t readily available in the Indian market. Please do let me know! You will need to look out regularly and buy it during their offer period to get a good discount. Prices vary based on when you shop and the quantity you buy. Dear Roma,Your blog has been very informative. Thank you. I have been using Bosch d/w for more than a year now, and I have forgotten how to clean utensils by hand. In Chennai, Bosch and Siemens share the servicing. So far so good. I just want to know about the power ball. I buy finish powder, salt and rinse-aid online. I run my d/w twice a day on 1hr.20min.cycle.The vessels are not greasy. I have ordered power ball today. How many tablets will I have to use per wash? Please let me know. Nice to know that you have been happy with your dishwasher for over a year now. You will need a single powerball tablet per run of the dishwasher, in any mode (party/regular/quick wash). The powerball works out more expensive than the finish powder. However, it leaves your dishes sparkling clean with no overhead of rinsing them. Thanks for the prompt reply How often do I check for the offers on power ball?. Viji, You can check for offers may be once a week. Bosch models are good. Try to go for a water-saving, energy-efficient model. You can consider Siemens as the servicing is good. My dishwasher’s model number is SE24M268EU/36. We brought a Siemens dishwaher from Siemens showroom in Bangalore on 5-Jan. Installation and demo was done today. For trial run I placed few vessels. The washing is good at the first experience. I wish I get a very good experience with dishwasher going further. Thank you for your valuable information, feedback and comments. Awesome, Revathi! Welcome to the club! Would you please guide me about collapsible arms? how to do it? I have siemens DW but didn’t found this option in manual. You need to have a model which has collapsible blades for that. Please look at the bottom tray and see if the blades (for plates) can be pushed down easily. If you can’t, then your model does not support it. I am planning to buy a dishwasher.. but have few questions… Please help me ..
1) Does it cleans Milk/Tea vessels?? 2) Can we use nonstick cookware in dishwasher?? 3) Do we need to do rinse before loading the dsihes?? 4)how much time it will take for dishwashing for regular usage ?? 5) Does it cleans idly plates also??? Could you please help me on this..Thanks in advance..
No, if you are using powerball tablets you dont need to. It takes approx 135 mins. and i searched for stain less steel cookware items in the net and i found like sandwich stain less steel cookware is available to cook curries/fries.. does it really support ?? below link i got it for sandwich stain less steel. Ashvini, you can find your answers in the blog post. Please do give it a good read as you will find most of the information you are looking for. You can not wash aluminum or non-stick cookware in a dishwasher. Yes, stainless steel is good. The link you sent has a vessel which appears dishwasher safe. May be Seimens is the best Dishwasher? What is the warranty for these dishwashers. Hi Virendra, sorry I am unaware of these details. Kindly check with the service center. Hi Roma, great info. I have been looking for dishwashers for a while now and most of all that I know is through your blog. I live in Vijayawada,AP and every showroom that I have gone, I’ve been told that they have no demo piece.They say that they will place an order once I’ve made up my mind. Please understand that I am asking for your advice for lack of a better option. I was initially looking at Samsung DW-FN320T ,because of it’s three power nozzle. I also liked the Bosch SMS40M52EU & the LG D1451WF(don’t know how many nozzles they have!!). The only problem is I’ve not seen any of these physically. Feels like the three blind mice. I’m told Samsung has good features but is not as physically solid as the Bosch. Also, LG has 10 yrs. warranty on it’s efficient and silent motor. Please opine. Again, sorry to bother. Thanks for stopping by my site and leaving your comment. I dont have any information or feedback regarding the LG dishwashers. Sorry about that. Yes, the Bosch and Siemens models that I saw in the showrooms looked great. Actually, people do say that Bosch is better than Siemens. However, I didnt go with Bosch as that would need me to cough up a bigger price for similar features. So I decided to go with the familiar and predictable Siemens. You can go with Bosch or Siemens. Both are good. As for LG, I dont know much about the make but I do know that LG product servicing is in general very good. This is a very nicely written and informative article. Thanks for putting it together. I don’t see the model you listed in siemens website. Any idea? Also can you advise on what is the running cost per month – finish balls + salt + electricity assuming that we go for one run per day . I am also looking at the LG model. It is a 14 place setting and comes with a good set of features – collapsible plate rack, ability to wash either top or bottom rack, inverter technology to mention a few. I have seen the machine physically and it’s looking neat. But unable to find any user reviews unlike siemens. Hence unable to decide. Have you finalized on the model? Dishwasher salt costs Rs 100 per kg and it lasts approx. one month. Rinse aid costs Rs 300/- for 400 ml bottle which lasts 2 months or so. The cost of power ball tabs varies from Rs 12 to 40/- per tab depending on when you buy it. The cost of electricity shot up by about Rs 700-800 per month since we started using the dishwasher everyday. 1. after the wash cycle does the dishwasher leaves the dishes 100% dry? if i take the vessels after few hours will it be dry or have water vapors from steam?? 2. do I need to buy a stand, bcuz siemens dealer doesnt recommend however the service center recommends?? 1. Yes, the dishes are 100% dry. However, if the dishes were not arranged correctly or if they got mis-aligned during the wash they could be wet. 2. Yes, its a good idea to buy a stand. Hi roma I ve purchased seimens dishwasher recently. I arrange them properly and use detergent, rinse aid, and salt from finish. somehow I find them not cleaned to satisfaction. milk dishes are not very clean. main problem is i find detergent spots on some vessels. what could I be doing wrong? Please use finish powerball tablets. Otherwise, you will need to rinse vessels before loading in the machine. I finally purchased siemens DW, wow it is amazing and sparkle clean. Thanks for your feedback and reply. Can you please let me know where do we get powerball/quantum ball tablets .. @ chennai or online. Congrats, Priya! Welcome to the Dishwashing club. You can import the finish powerball tabs from eBay. Keep a watch on the price, buy when it drops. Offer prices can get you powerballs as cheap as Rs 15 per tab. This is naveen from tirupati. Cant do much , Naveen. You can check if the nearby cities can ship one to you. Even then you might have issues with servicing in future. i purchased IFB Neptune DX last week(after feeling assured by this blog) it is amazing for Indian utensils. just have to rinse off particulate matter before loading into dishwasher. And one more tip : Use half the quantity of recommended detergent or else soap residue remains on utensils/crockery. contact me dr.sneha.s.bhavsar@gmail.com for any query on IFB dishwasher. Hi Roma, can the reetha liquid be used instead of the regular powder or Finish tabs? Hi Arvind, actually reetha liquid can not work as a replacement. Very nice blog !! 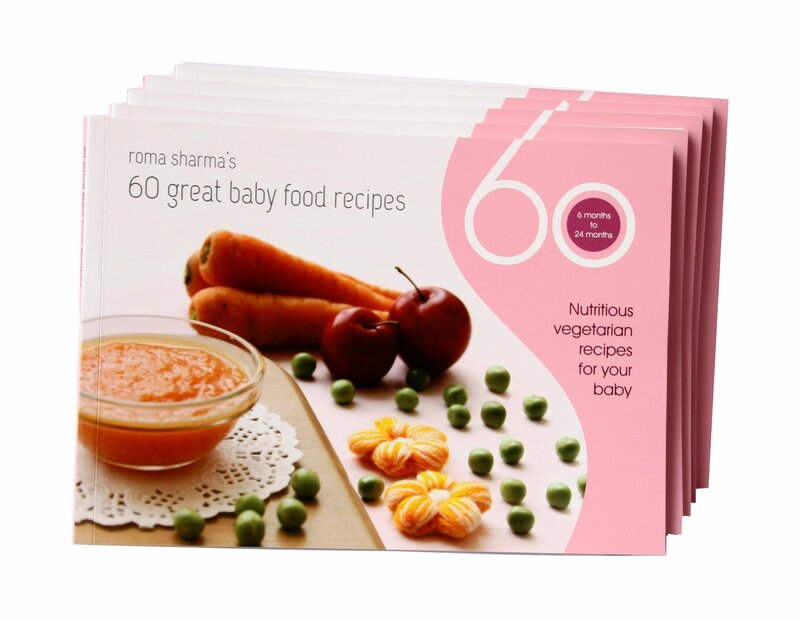 Planning to buy one … Can u suggest me the latest model in Siemens which suits our Indian cooking … .? Thanx for all your informations . So sorry, I am unaware of the latest model. Mine is 2 years old and works fairly well. I m planning to buy bosch dishwasher can u suggest me difference I model SMS40M52EU and SMS40E32EU. I’m sorry I’m unaware of the difference between the specific models mentioned by you. Very informative post on Dishwasher. I took the plunge recently, but was disappointed very soon. I bought a Samsung Dishwasher. It came with only two Finish Quantum Powerball tablets. The first wash was very exciting, sparkling shiny utensils, but after these two tablets finished, we searched for these Tablets, in Delhi and NCR superstores, but could not find it. So we bought Finish Dishwasher Detergent, Salt and Rinse Aid. What a big disappointment, all dishes came out covered with a whitish layer. On searching the net, it appeared to be due to the hard water in our area, despite using the salt as a water softener. We can not change our area’s water, and now left with Dishwasher which leaves a white film after wash.
We tried Finish Powerball on the eBay India, but they were quite expensive, each costing around 48 Rs. I want to ask, did you ever have this white film problem on the utensils after the wash with powerball tablets. 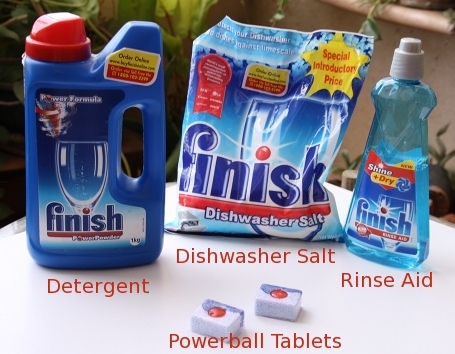 Have you tried Finish Detergent powder, or you have always used Finish Powerball Tablets only. How can we find Finish Powerball Quantum Tablets in India cheaper. In USA they are available around 15 Rs each. Did you get cheaper price on eBay India. I tried ordering it from eBay, but it says, it would take 15 – 20 days, as the product would be shipped from USA. Is there any other way of finding these Finish Quantum Powerball tablets here in India. We are really disappointed with the white film on our utensils. 1) Currently, there is no place that sells powerball tabs in India. I have only bought it from eBay so far. 2) I have not really faced the problem of a white film on my utensils. I have used detergent only a few times, long ago. Dont remember any problem with the wash back then. 3) Yes, powerball does cost Rs 48/- per tab and sometimes even more. We usually just watch out for offers and when it becomes cheap (like Rs 20+ per tab) we buy in bulk. 120 tabs at once keeps us going for a few months. 4) eBay does say 15-20 days. However, sometimes I have received tabs within 5-6 days of ordering. Thanks Roma for your answers. We are disappointed by the White residue on our dishes after the wash.
Samsung people are of no help. They attribute it to hard water. Disgusted with their callous attitude. We have tried various detergents, Finish Powerballs but the problem persists. In your large circle , did anybody have the same white residue problem. And what is the remedy. Our initial enthusiasm has just evaporated. 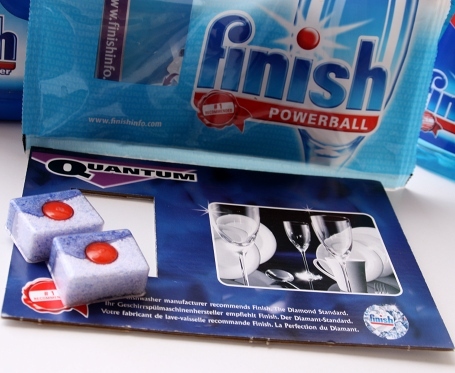 In addition, I advise these dishwasher companies to make available these Finish Quantum Powerballs in India, by making an agreement with Finish makers. There is no point in selling a machine, if the recommended detergent is not readily available locally. Sure, where is the questionnaire? Please find the link for my questionaire below and if possible try to circulate it with your family, friends and relatives who have dishwasher as well as not.Your each input will be valuable for us while designing the dishwasher. I got my siemens dishwasher this week.but i m noticing detergent residue on the few steel vessels .have ran the dishwasher on auto mode. I used the finish powerball tablet.am i supposed to add rinse aid and salt along with the powerball tablet.as the service guys told me no salt or rinse aid required when using powerball tablet. Yes Vidya, you need to use rinse aid as well as dishwasher salt along with your powerball tablet. There should ideally not be any residue this way. Thanks much or the explanations and your prompt responses. I have recently purchased a Bosch Dishwasher but couldn’t even do a first wash as Salt is not available. It came with a sample Quantum tablet but no salt. The water in my area has quite a bit of iron. The Finish order toll free line that I called to place an order for Finish Salt said it will not be available before mid Feb but she said you can use the DW without salt if you are using a tablet. Have you ever tried the tablet without salt in hard water? Hi Shelu, I have not attempted using dishwasher without salt. Very nice article on the dishwasher. I am planning to buy the Siemens Dishwasher, but lil skeptical on how it works and how the results will be. Planning to get the Powerballs for dishwashing. Just wanted to know it is needed that we need to run the dishwasher for 2.30 hrs, that full cycle? Because mine is mostly less oil and less greecy and mostly tupperware lunch boxes, lot of milk and curd vessels. I know it comes with practise on what mode to us. But given the eb rate in chennai (7/unit), i am lil skeptical on this, as it should not end up scooting my EB bill. Yes, you will need to run the whole cycle of 135 mins or so. If the dishes are more or less clean you can opt for the party wash mode. However, while cleaning milk and curd vessels I think the regular wash is best. Your electricity bill will not really shoot up if you buy the energy saving model. Please check the power usage per wash and make a calculation before buying. I have called up Siemens for pre delivery investigation. The person told that the water pressure is low since I am staying in the top floor of the building.and we need a booster pump. Do you have any idea about pressure booster pump with auto on-off? I am getting flowrate of 5-6 lpm where as actual requirement is min 10 lpm. Hi Samrat, I am so sorry I dont have any idea about pressure booster pumps. I too would like to make a pre delivery investigation. Could you give the contact? i am using ifb dw from 2 years n using steel vessels mostly,and find difficulty in washing many of vessels hav not been cleand properly, soap is always there near the sink.i m using all the ifb products. plz help me if u hav eany suggetions. So sorry. I dont have any idea about IFB products. Does the Diswasher also cleanses the rice/foody stuff that gets stick to bottom of any rice cooker as a result of , may be, improper cooking or less water ? I really doubt this. And YES, thank you for sharing DW info. Appreciate the time you took to write such an informative article. I need to ensure that water is there in vessels so whatever is stuck, softens up otherwise it could get tricky. Very informative. Planning to buy Bosch dishwasher, costs about 37,000. Has an ‘Intensive Kadhai’ washing mode. But I’m not sure, they have good after-sales service. Also, I wonder, how long do dishwashers last.. They last well. I know people who are maintaining it well from 10 years. Hello Roma, It was a delight reading your detailed article. Thank you for all the time invested. Joining your dw club soon as even I am going to buy myself a dw tommorrow but LG make. I am also frustated by the maids and their behaviour. Yes, I am still using it. Its my saviour! Not sure of the current models. Mine was a basic one with time indicators. Hi Roma! After the required research I have bought a LG dw. Do you wash cookers with backlite handle in your dw? Is it safe? Mine is a prestige stainless steel cooker with black handle. Kindly reply. Hi Meena, yes stainless steel cookers can be washed in dishwasher. Thank you for the very informative blog Roma! I see in your comments that you have recommended the Siemens dishwasher. 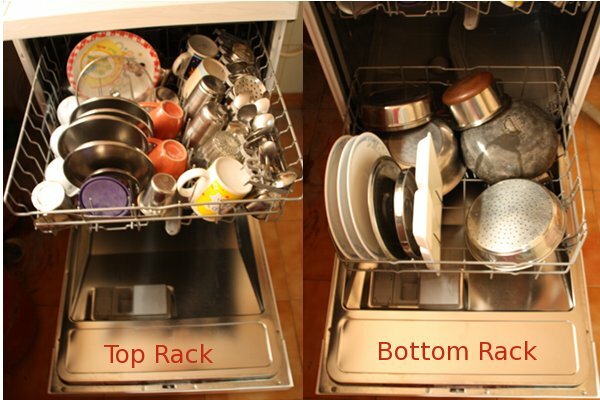 A new model of lg dishwasher has fully collapsible blades on all racks unlike the Siemens or Bosch model which have a few collapsible blades and few fixed ones. Do you have any idea about its performance? Hi, So sorry I dont know anything about the LG model. Hi Roma! So informative and nice blog. Tried to get information on various site but fond your place immensely helpful.Thanks for sharing views! I want to purchase a dishwasher (Freestanding) and convinced by your opinion of Siemens . (3) I have pressure cooker made of handolium , will this be safe to be cleaned in dishwasher? (4) Any suggestion for the model if I am planning to set the dishwasher inside the modular kitchen in future? (5) Any additional hidden cost apart from general purchase of dishwasher (Specially Simemens ) . So sorry, I cant suggest a model. Not sure about Delhi. You need to check with the locals. Unfortunately, no suggestions for model. No hidden costs. Just installation charges. You can purchase on Amazon and it is cheaper there. Local stores sell it for MRP price. > (4) Any suggestion for the model if I am planning to set the dishwasher inside the modular kitchen in future? It should. The technician will remove the top and other supportive boards to fit well. > (5) Any additional hidden cost apart from general purchase of dishwasher (Specially Simemens ) . Could you be more specific when you say hidden cost specially in Siemens? Hi Roma , thanks a ton for your blog post. I am fed up with my maid and want to buy a dishwasher asap. Since I am using bosch washing machine ,I did a quick survey of their dishwasher. I am very disappointed by the fact that standard dishwasher will not fit into my big kitchen. I will have to remodel it. So my question is does Siemens have a portable dishwasher or do they have a dishwasher which is less than 24″×24″×35″ ? My kitchen is big but counter height is short. How have you installed your machine? I have gone through the Q&As . Let me add two points to your great write up. 1) if the you have hard water in your area. Your utensils will become white .you have to have a water softner to make your dishwasher successful. TDI <400 . No sales person will tell you at the time of selling. 2) if the water pressure is low. You will have to install a single point booster pump. I have it for my bosch washing machine. It's must that people get a thorough Pre delivery inspection done before purchasing. Technician should check the water pressure and TDI so that there is no hassle at a later stage. And warranty is intact. I have recently purchased a Bosch dishwasher 12 place settings. My dinner plates have been washed properly but spoons which had dried milk products were not cleaned and it remained the same. I washed it in eco 50 degree with extra drying option. The upper tray was almost fully loaded and the lower tray was partly loaded. I also went for a half load option. So did I do something wrong? What option should I go for to get the dried milk products clean from the spoon?